Dental and mouth problems, especially caries, frequently happen to 60-90% school children aged between 5-14 years. Caries happens because children tend to like sweet food, which carries the potential of causing dental caries. Children love candies. If children consume too much sweets and rarely brush their teeth, they will get caries. Sweets are considered as a cariogenic compound, because sweets cause caries. 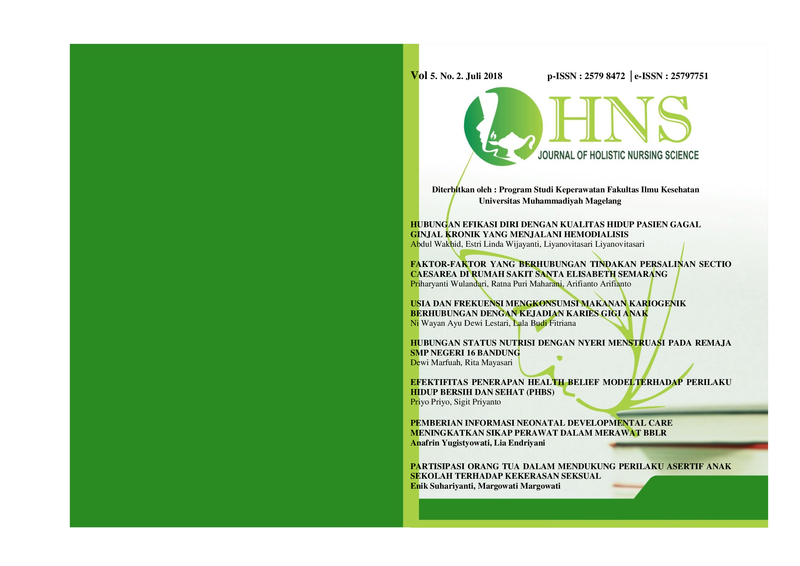 This research aims to determine the correlation between age and frequency of consuming cariogenic food and dental caries incidence among children at ‘Al Huda’ Islamic Elementary School, Karangnongko, Maguwoharjo, Depok, Sleman, Yogyakarta. This is a quantitative non experimental research which used an analytic correlative method with a cross sectional design. The samples for this research were first to fifth graders of both A and B classes, there were 72 respondents selected as samples. The samples were selected using a stratified random sampling method. Data for this research were collected by means of questionnaires and observation sheets. The data collected were analyzed using Mann-Whitney u test and chi-square test. The statistical test on the correlation between age and dental caries incidence showed p-value = 0.043 < 0.05. Whereas the statistical test on the correlation between cariogenic food consumption and dental caries incidence showed p-value 0.620 > 0.05. There was a significant correlation between age and dental caries incidence among children at ‘Al Huda’ Islamic Elementary School, Karangnongko, Maguwoharjo, Depok, Sleman, Yogyakarta, and there was no significant correlation between frequency of consuming cariogenic food and dental caries incidence among children at ‘Al Huda’ Islamic Elementary School, Karangnongko, Maguwoharjo, Depok, Sleman, and Yogyakarta. Future researchers are expected to be able to examine other variables that affect dental caries in children such as heredity, race, chemical elements, saliva, oral microorganisms, plaques, and microorganisms as well as research in a wider population.